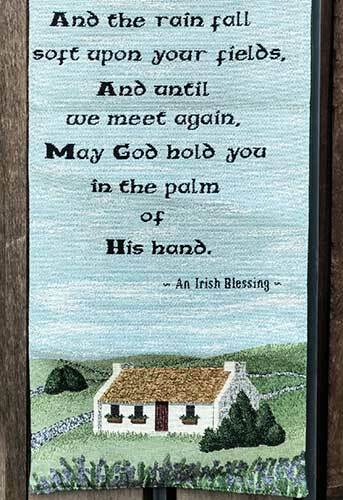 Irish wall hanging features the quintessential Irish blessing on a woven banner that is complete with a decorative top. 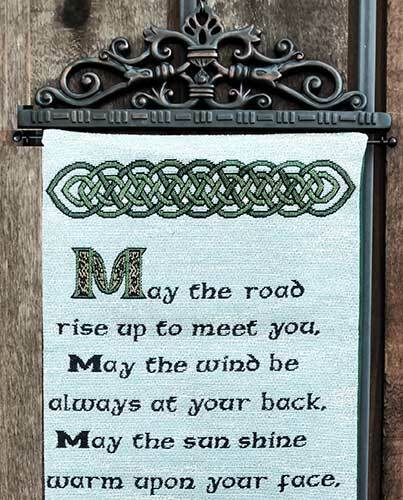 This Irish blessing wall hanging would complement your home decor or make a great gift. The cloth Irish wall hanging measures 13" wide x 36" long and is complete with a resin top. The colorful wall hanging features an Irish country scene with a thatched roof cottage and it is enhanced with Celtic knot-work. This Irish blessing gift is made in the United States (the resin top is imported) and is received with a Celtic knot history card, complements of The Irish Gift House. Irish banner features a home blessing that is enhanced with a Celtic cross along with Celtic knot-work and shamrocks.